Yes ! Zhe same whith me . I don’t look blind too ! Well it is really funny. A week ago a man looked at me at the gas station and he said: why are you using that white cane? are you blind? and I say yes I am. The man replied: Oh, oh, it is so sad. How can you be blind being so pretty. I am not saying this because I want to say I am pretty, the thing is how do people believe blind or disabled people look like?, so if you are blind automatically you have to look ugly or like an abomination? Blind people looks normal that is it. People has that stupid idea about blindness. 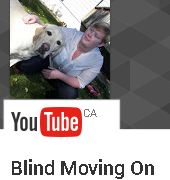 I also believe is a lack of education regardless blindness or any other disability. We should be more careful with our statements or declarations about people, not just sighted people or people without disabilities but also us blind or disabled people we have to be careful and educate others to be more assertive with their comments.